Former Indian Police Service (IPS) officer Kiran Bedi Thursday joined the BJP and will be fielded in the Feb 7 Delhi assembly elections.Flanked by Bharatiya Janata Party president Amit Shah and union Finance Minister Arun Jaitley, Bedi became a member of the party by dialling the toll-free number started for the BJP's mass membership drive.Shah announced that Bedi would fight the upcoming assembly election in Delhi. He added that the seat from which Bedi will contest the polls has not yet been decided. Shah refused to comment if Bedi would be the party's chief ministerial candidate in Delhi. "She will certainly fight (Delhi assembly) election, but who will be the chief minister from the BJP will be decided by parliamentary board," he said. 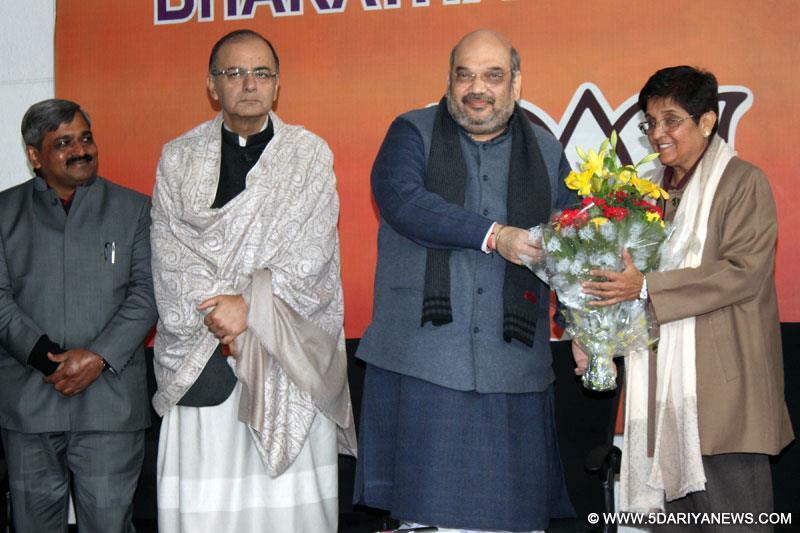 Both Shah and Jaitley said Bedi joining the BJP will give the party a boost in Delhi. "Kiran Bedi joining the party will help us fulfilling people's expectations both during and after the election," Shah said.Speaking later, Bedi said a stable government was what Delhi needed.Bedi, a former top cop and social worker, was attached with Anna Hazare's India Against Corruption, which also had in it Aam Aadmi Party chief Arvind Kejriwal along with Prashant Bhushan, Shanti Bhushan and Swami Agnivesh.